In a Foreign Land, Driver Delivers Safe Passage While it may sound lavish, it is a practical and often required practice to hire a driver for foreign reporting assignments. Our driver was a quietly persistent man who personified the stoic determination of the people living at the Tibetan frontier of China's Yunnan Province. 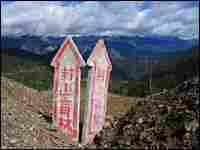 The driver drapes Arnold's prayer flag on an isolated shrine in Yunnan Province, China. While it may sound lavish, it is sometimes a practical and often required practice to hire a driver for foreign reporting assignments. Local drivers know the customs and the lay of the land, and driving in some places can be downright hazardous. The Tibetan edge of Yunnan Province in China is one such place. The roads in the region are still being built -- there's no other way to put it. Steep, narrow and punctuated by blind curves and mudslides, they are harrowing by day and useless by night. 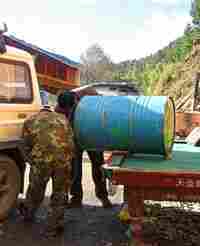 For this assignment, the driver was Tibetan named Lhakpa. 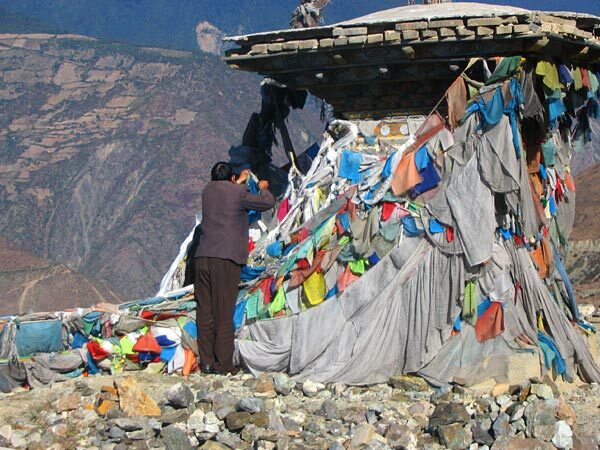 With a wide smile, he managed to cram us and all manner of sound recording equipment into a battered jeep, without disturbing his delicate dashboard shrine of prayer flags, beads and juniper incense. Within the first few rugged miles of several hundred to come, Lhakpa's skill and fame became apparent. Dodging yaks, pigs and women hauling enormous loads of oak branches, plunging through mud holes and inching over precarious mountain passes, he would softly sing along with a scratchy tape of Tibetan folk music. In the back seat, white knuckled, I soon gave up worrying. And in every village, no matter how far-flung, Lhakpa was greeted like royalty. It seemed absurd, with so many people in China, how someone could be so well-known. His expertise and contacts served us well. No matter how hopeless the passage -- a missing stretch of road due to a recent landslide, or an obstinate Chinese official shaking his head "no" -- the driver would quietly and calmly find a way. And no matter how road weary we became, or how desperate the accommodations, he would manage to procure from some new or old friend a cold bottle of beer, an egg, or some rarity to revive us all. Lhakpa did his work, and we did ours. While we climbed and interviewed and recorded, he would tinker with his jeep and smoke, or find a card game. While we napped and logged our tape, he'd safely take us another hundred miles high into the Himalayas. While my job is to ask questions, he would have none of it. He surely had a story of his own, which I only learned through others. 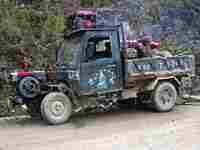 He'd been a driver for the government for 30 years, ushering many a Chinese official through rural Yunnan. Now, semi-retired, Lhakpa could drive whomever he pleased. He seemed to like us, although he had little use for me. As a woman, I surely must be along for the ride, someone's wife or assistant -- an attitude I've encountered often on foreign assignments. But he would laugh at my horror when I would pull something strange from the hot pot at dinner, a chicken foot or yak belly. At least I was good for a joke. His quiet ease became my reference point for a place I was trying to understand -- the Tibetan's stoic determination, despite China's iron will, to hang on to a rich and deeply rooted culture. Near the end of our journey, he left me with one small gesture. After several hours interviewing at a busy roadside shrine, we were finally back in the jeep, a much needed shower still hours away. But again, we were stopping. Perturbed, I realized it was yet another shrine. I quietly groaned. But this one was different. There were no noisy tourist buses or pilgrims asking for money. 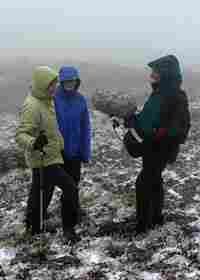 It was desolate, and yet afforded a spectacular view of the scared mountain. Lhakpa opened my door and without a word, pulled out the string of brightly colored prayer flags I had bought a few days earlier as presents for back home, the kind people put on their porches to boast they've climbed some Himalayan peak. Ignoring my protestations, he walked to the shrine and carefully strung them up, lit some incense and bowed low in the direction of the mountain. Returning to the car he gave me a thumbs up, and resumed the drive. 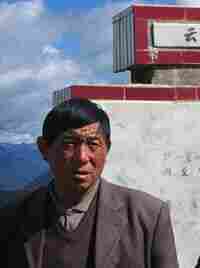 In that small moment, I was both chastised and blessed, and Lhakpa's is the face of Yunnan I'll remember the most.